My best hamburger recipe cuts 124 calories by using ground beef with reduced fat content. Four ounces of 75% lean ground beef has 316 calories. Compared to only 192 calories for four ounces of 95/5 lean ground beef. A whopping 124 calorie difference. You can dramatically cut calories in hamburger meat recipes by simply reducing fat content. Use a three ounce, 95/5 burger with tomato, lettuce, onion and Miracle Whip instead of mayo and you have a genuine low fat sandwich suited for many healthy lunch ideas. The best hamburger recipe starts with fresh ingredients. 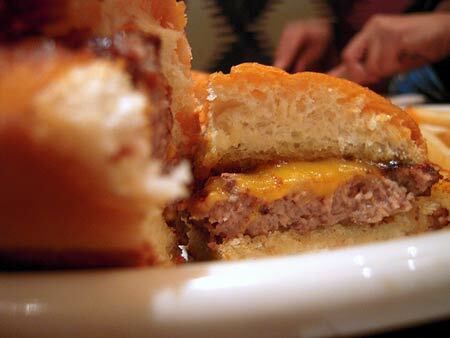 NOTES: Some recipes call for egg and bread crumbs to hold the patty together. I've also read that too much handling of ground beef when pressing out patties makes the burger tough. I have to disagree with both statements, my burgers are always juicy even though I "knead" the beef together to eliminate air and holes, and press patties firmly enough to hold together and not fall apart. I think the real secret is to NOT overcook. It's when they are overcooked the burger gets tough. Never press patties when they are cooking. Make the patty thinner than you want when shaping, it will shrink and get thicker as it cooks. Flattening out with a spatula while cooking squeezes out all the good flavor and makes meat tough. Use fresh ingredients and bakery made hamburger buns. The key to the best hamburger is fresh ingredients prepared correctly. CALORIES: 4 ounce (1/4 lb.) hamburger (lettuce, tomato, onion, Miracle Whip) = 337 calories. With cheese, 437. Make that a 3 ounce hamburger for 289 calories or 3 ounce cheeseburger for 389. Heat cast iron skillet (or frying pan) over medium high heat. Season ground beef with salt and pepper and mix well. Make four equal size balls of meat. Press into patties between a piece of wax paper. Form patties well so they don't fall apart when cooking. Patties should be thin and larger than buns, they will shrink when cooked. Cook for 3-5 minutes, flip over and place cheese on hamburger. Continue cooking for 2-3 minutes until beef is done and cheese is beginning to melt. Avoid overcooking for the juiciest burger. Place on bottom slice of hamburger bun and serve immediately. TOP WITH ANY OF THESE: Miracle Whip, mayo, ketchup, mustard, chipped dill pickles, bread and butter pickles, lettuce, tomato, onion. Cheese: American, cheddar, swiss. To get your free Starter Course, FREE WEIGHT LOSS HELP, fill in your name and email address below. I'll send along the starter course and Special Report to your inbox. IMPORTANT READ THIS: Foolproof Weight Loss Solution (FWLS) requires time to read, understand and apply. To achieve results with FWLS you must follow the system as outlined. The information and contents of FoolproofWeightLossSolution.com, or any product, service or communication are not to be used as replacement or substitute for medical, psychological or professional care. The information, content and strategies offered may not be suitable or applicable for your individual or personal situation. The publisher/author urge you to consult with your physician and get his/her approval before beginning this or any weight management program.